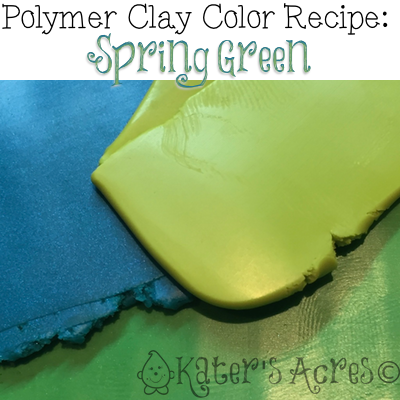 This spring green clay color recipe is a green lovers treasure. I love green … so much so that it’s one of KatersAcres primary colors. Coming up with variations of greens to use in my designs is always fun and seems to be endless with hundreds of combinations to choose from. I have been returning to this simple color often lately and I hope you enjoy it as much as I do. Enjoy! Add 1 part additional Peacock Pearl for a more blue-green. Add 1 part additional Wasabi for a brighter green. Add 1/2 part Premo! Silver for a nice added shimmer with a hint of depth. Add 1 part Premo! Pearl for an instant lightness and brilliance. Add 1/2 part Premo! Black for a deeper green, reminiscent of seaweed. Free polymer clay tutorials are made possible by Whimsical Sculpting Tutorial Club Members.